NaNo starts tomorrow! I won’t be posting on the blog because of it, but will be back in December. I am not very prepared this year and will be writing as a pantser for the first time. I have a very, VERY, rough outline with really just the beginning. I will be using my NaNo Jar prompts big time this run. The idea is to create a “choose your own adventure” style story that will eventually be playable via phone and/or smart watch. Yeah, I have no idea how this is going to turn out. It’s worth a try though, right? Since it’s been a few years since the first NaNo Jar post, you’ve probably used up a majority of the prompts by now or are tired of a few of them. I’ve gone ahead and pulled some more for you that you can add or replace to your happy little jar! It’s been so wonderful hearing about your success stories with the jar. I love getting feedback and hearing how the jars work for you guys. If you have any suggestions on what you’d like to see in future prompts, I’m all ears! Some of these are more for editing, but will enhance your story. If you would prefer more story driven prompts over editing prompts or vice versa, please let me know! 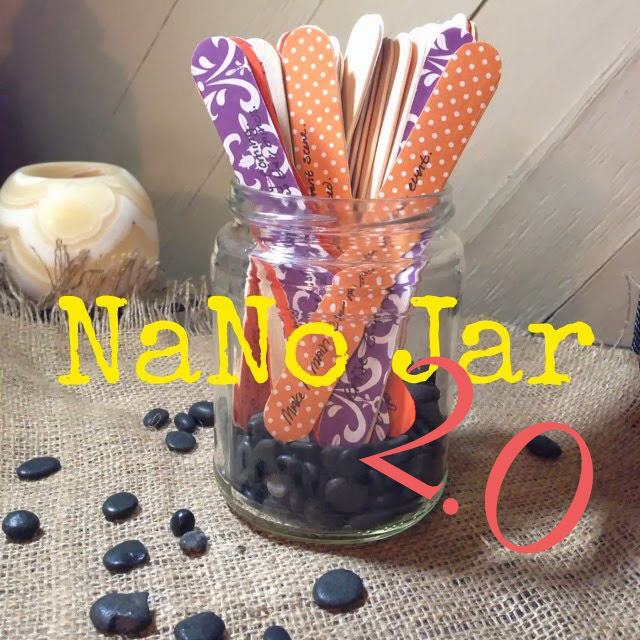 If you’re new to the NaNo Jar—the original story prompts and instructions are found here. Please enjoy and let me know how they work for you! Have one of the main characters sacrifice something dear to him. What is a flaw of yours you can’t fix? Give it to your protagonist. Who would you be in your story? Make that character more like you. Pick a scene and take the strongest emotion and replace it with three other emotions. Pick a passage of exposition. Delete it and create that emotion through action alone. What does your protagonist want most? What is opposite of that? Can your protagonist want both things? What is the worst thing your protagonist’s weakness can cost him? Make it happen. Make a character paranoid that he is the target when he isn’t. Write out three secrets that each of your main characters could possibly have. Choose the one that will impact the reader in the most dramatic or surprising way and add it to the story. Pick a scene and rework the dialogue so that your characters become more assertive in their roles. Look over the setting of one of your scenes. Is it an obvious or overdone setting? Change it. Create a time limit for one of your characters. Think of obstacles that will prevent your character from finding relief during this time frame. Add: a character that brings more trouble. Is there someone the protagonist cares about that can be caught up in the trouble? Make it happen.